Does anyone else find the Dragon Knights catapult on the large castle set to be a bit cheesy? It just looks like something the enemy would laugh at, not fear. I know all LEGO sets are directed towards a younger audience but I think TLG could've done a bit better when it comes to that part of the set. What are your guy’s thoughts and comments? Justin M wrote: Does anyone else find the Dragon Knights catapult on the large castle set to be a bit cheesy? Yeah, I think it's kinda silly. Did you see the one that comes with the gatehouse? Blocky and looks a bit clumsy... obviously they could have done better. But maybe this is a trial run, to see how the younger audience will react or whatever. Yea but the clumsy one looks much better and a bit more in the realistic way then that childish "KKish" "dragonpult". The flick ballista, I think also is an improvement to the flick missile launcher that TLG has made before, because it looks like an ballista and with a few improvements it with look good. mencot wrote: Yea but the clumsy one looks much better and a bit more in the realistic way then that childish "KKish" "dragonpult". The flick ballista, I think also is an improvement to the flick missile launcher that TLG has made before, because it looks like an ballista and with a few improvements it with look good. I will agree it does look a bit more realistic. Yes, with a few improvements, the flick Ballista would great. Though there's a few things in these sets what I'm not the biggest fan of, everything can't be perfect so all in all their not entirely dissipointing. Let's be happy we even got new Castle sets. LEGO The Lord of the Rings 79006 The Council of Elrond by THE BRICK TIME Team, on Flickr. Looks like we may be getting a new arch and a coloured leave. I like those arch pieces. They are available already in black but not gray as far as I know. Getting kind of sick of Gimli coming with every set. I think the sets look pretty cool. And new leaves is always good with new colored arched, heck that sounds like a deal! I might just pick it up along with the wizard battle. Now decent pictures are available for the entire Castle & LOTOR range I'm pretty confident of getting at least the two smaller LOTOR sets. The Black Gate doesn't do much for me and apart from the Eagle and the Mouth of Sauron the figs are nothing special. I like the Ghosts and the Shields in the Crosair's ship but I already have a Lego ship so would be hard-pressed to get this one (another corsair or two wouldn't have hurt). The Castle sets actually look a bit better than I expected but at this stage I'm going to retrict myself to the GateHouse Attack (for the barding and black Knight armour) and Dragon Mountain for the dragon, wizard and princess. Maybe an Ambush Attack to boost my troop numbers. The Arwen minifig looks great. I'm a little disappointed at how lazy they got with the 'wizard's duel' set, I expected a little bit more from it. the LotR sets look ok, but nothing to get to exited about. the black gate and ship seem pretty good design and parts wise, though the minifigs/eagle appear to be the main attraction in both. as for the council of Elrond, I can handle the weapons wrack being randomly stuck in, I can even handle the building having no interior, but what in the heck is is up with that goofy catapult thing? (since when did the council of Elron start using ejector seats anyway) seriously lego couldn't we have had some furniture or something instead. lord_of_orks wrote: but what in the heck is is up with that goofy catapult thing? (since when did the council of Elron start using ejector seats anyway) seriously lego couldn't we have had some furniture or something instead. I believe that is showing the scene when Gimli tries out his axe on The Ring. If you look closely, you can see The Ring on the pedestal directly in front of the catapult/floor section. 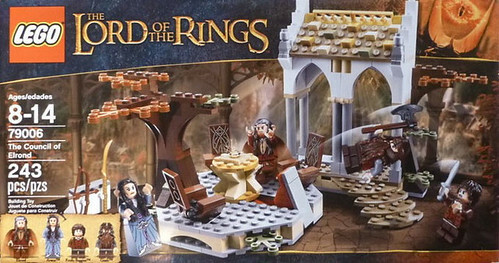 Oh, wow, all those LotR sets are a must get for me. Not to mention that the boat has 14 unused shields! And with a neat design, and no heraldry, those shields could be used anywhere! Really liking them! Can't wait till they come out.